Robert Alpers tends to a calf on his central Missouri farm. 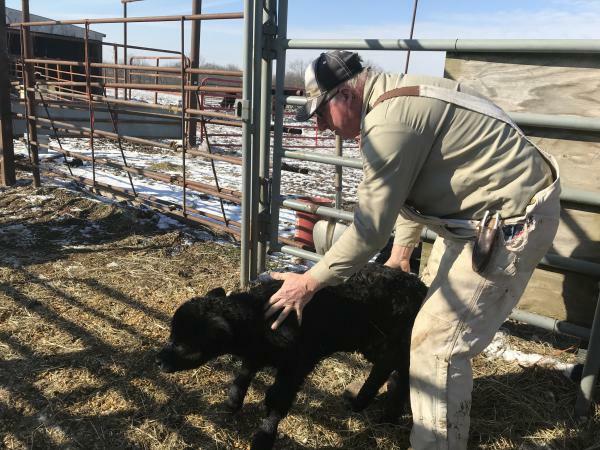 His cattle operation is one of the things that has helped his family farm survive the depressed soybean market brought on by the trade war with China. In other words, if you’re a farmer who plants only soybeans on relatively few acres, you’re probably in trouble. Harvest Public Media's Jonathan Ahl examines the three sizes of soybean players: small, medium and large. Large agribusinesses have worldwide sources and markets in lots of countries, and even medium-sized farmers in the U.S. have diversified enough to stay afloat. That’s the case for Robert Alpers, a farmer in the central Missouri town of Prairie Home. 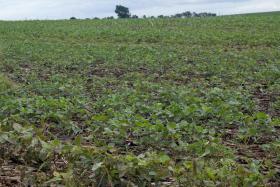 He farms 4,000 acres, about half soybeans, half corn. But his family also has a 550-head cattle operation and a side business of making and fixing farm necessities equipment like feeding troughs and livestock gates. The trade war and subsequent rough soybean market has had a negative impact on his family, but those other sources of income and the size of his operation has mitigated some of the pain. Alpers said between diversification and the tariff bailout payments from the U.S. Department of Agriculture, he’s in a good spot, but most of his friends and neighbors aren’t as lucky. They’ll have to make some difficult decisions this year, he said, because farmers don’t suddenly go bankrupt. They start cutting, borrowing more and eventually get in over their heads. And the low prices and lack of market access due to the tariffs are the kind of thing that can get that ball rolling. Even with his storage, cattle business and corn crop, Alpers said if there’s another round tariffs, he’ll be forced to make tough decisions. But it won’t sink him. “This farm has been in my family for almost a century. And we have plans to keep that going,” he said. Alpers also knows that large agribusinesses, the ones that buy, sell and process soybeans, will be fine. Cargill, Archer Daniels Midland, Bayer and even CropLife America, the trade group that represents the industry, declined Harvest Public Media’s requests to comment. But Cargill CEO David MacLennan told Yahoo Finance in late January that the company has “had to shift supply chains from North America to South America” — buying instead soybeans from Brazil and Argentina. Those places, Westhoff noted, aren’t in a trade war with China, and are markets that the multinational corporations already work in. “South American soybeans are going to be capturing a premium in the Chinese market than would they would have had, had it not been for the tariffs,” he said. Large agribusiness companies are lobbying the Trump administration for an end to the trade war so U.S. soybeans can fully return to the Chinese market. Cargill’s MacLennan specifically said in an January interview with Bloomberg that it’s in his company’s best interests to protect North American farmers. But as the tariffs continue, how long anyone in the soybean business will be able to last depends on how big they are.